The National Association for Spa and Wellness Tourism /NASТ/ is nationwide represented tourist association with non-economic goal, registered in the National Tourist Register of the Republic of Bulgaria. 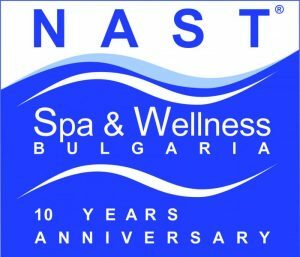 NAST is the first Spa Association in Bulgaria founded on 30.10.2004 in Velingrad by Spa Hotel Owners, as well as by main representatives of companies directly or indirectly involved in the Spa Industry, all of them sharing one and the same idea of establishing a clear Spa Concept in Bulgaria. The NAST members are four and five-starts Spa Hotels and Resorts, Spa vacation villages, having the capacity of over 8 500 beds altogether, Spa Treatment Studios, Spa Centre Chains, know-how companies, Spa and Wellness Equipment producers and sales representatives , Spa cosmetics and wellness equipment and accessories, Spa experts and therapy consultants , and tour operators..